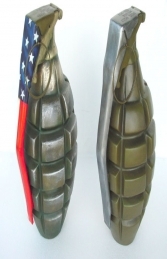 This wonderfully recreated 4 inch model Hand Grenade made from resin is again a great piece for Military displays and themed areas. 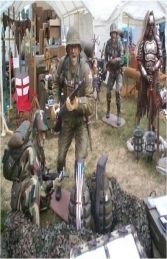 These will make great features in any Military themed area or a great accessory in a Military display. These resin model grenades always prove to be a big hit at every show we exhibit at, at Beltring we sold out with 3 days of the show to go!! DELIVERY PRICE ON APPLICATION FOR SINGLE PIECES. WE CAN SHIP UP TO 50 PIECES FOR £17.02 + VAT.